MA'AN Center - What is MA'AN Center? 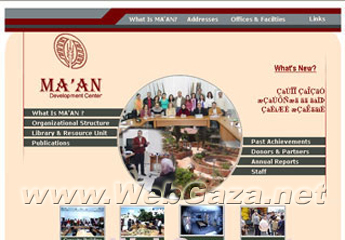 MA’AN Center is an independent Palestinian development and training institution established in 1989, registered by law as a non-profit organization. The main office is located in Ramallah and there are two other branches; one is in Salfeet and the other in Gaza. MA'AN's work is informed by the necessity of creating independent, self-reliant initiatives that lead to the achievement of sustainable development, and which incorporate values of self-sufficiency and self-empowerment. MA'AN especially appreciates the important role women and youth have in society, and therefore strives to enhance and increase their contribution in the community.